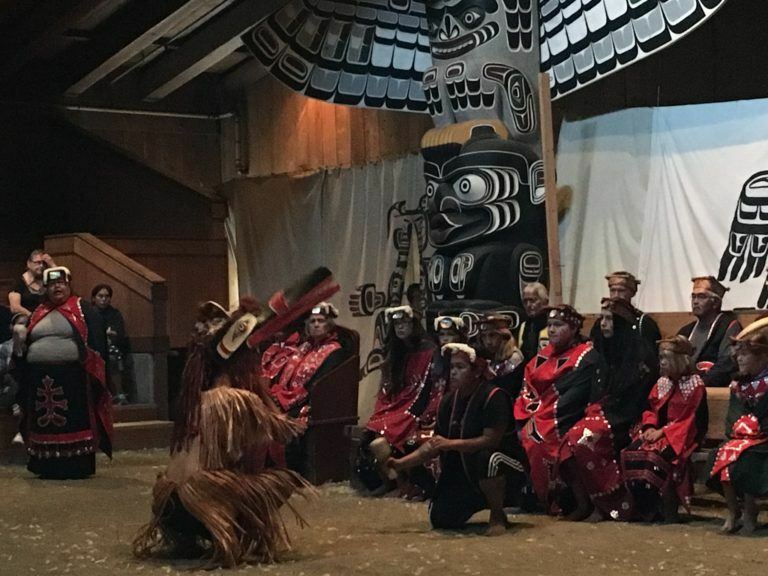 Salish Sea "Canada 150 Celebration"
Canada turns 150 this year! 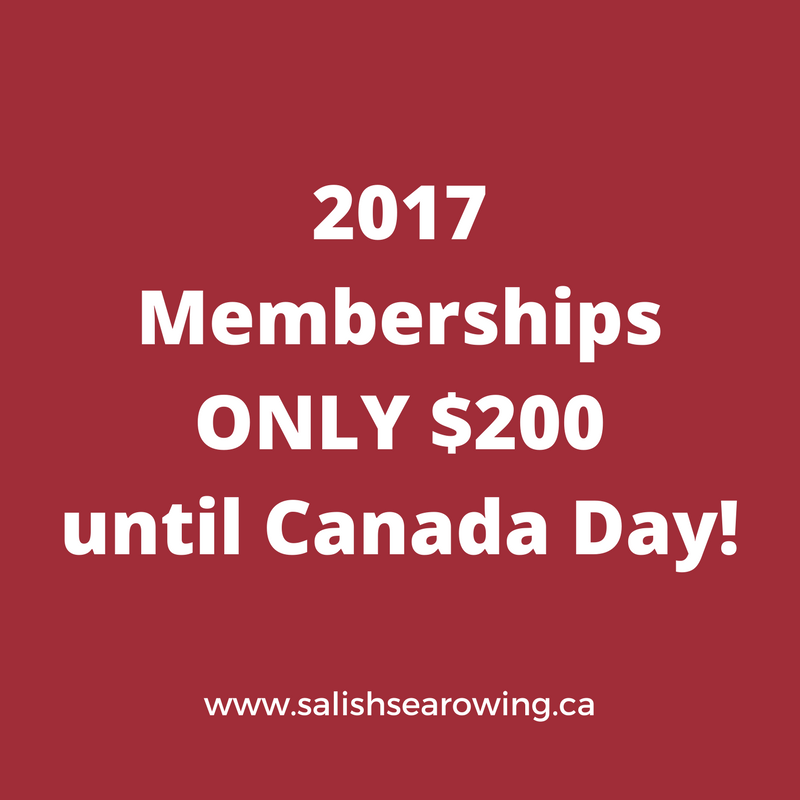 Salish Sea is helping everyone celebrate bygiving members $150 off the regular membership prices of $350 until July 1st only. Sign up before July 1st and enjoy full membership and benefits for the 2017 membership year. Our coastal quad is here and it is beautiful! The new coastal quad. The riggers fold up. The cox seat looks pretty comfortable. 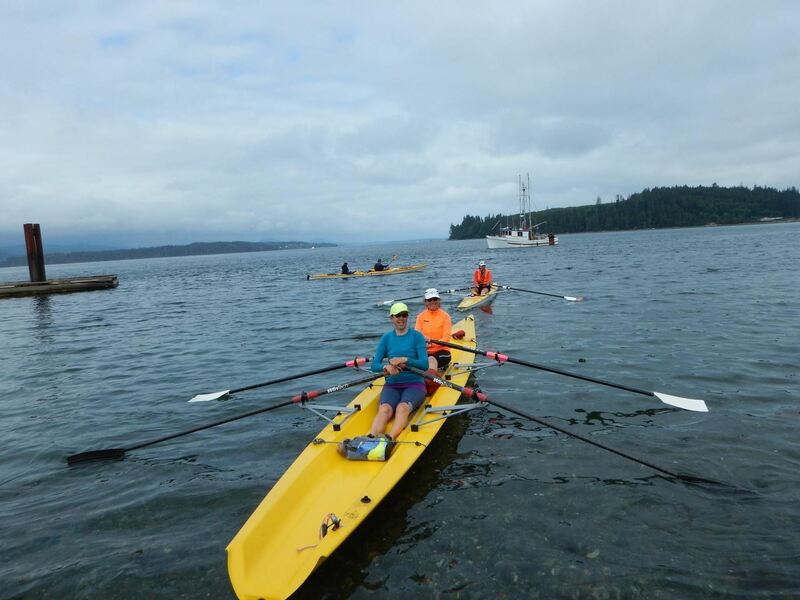 Due to snowfall and unsafe road conditions, the Annual General Meeting of the Salish Sea Coastal Rowing Club is postponed until Sunday February 19, 2017. Please join us at 4pm at the JERICHO Sailing Centre Members Lounge to discuss our first year, and develop plans for 2018. Members only please. Bring your ideas and energy to our AGM, and let’s crew together to keep our club vibrant and fun. SSCRC AGM Agenda and a brief Survey Monkey to follow shortly! The best laid plans of mice (and rowers), often go awry (sorry Mr. Burns for the mangling). 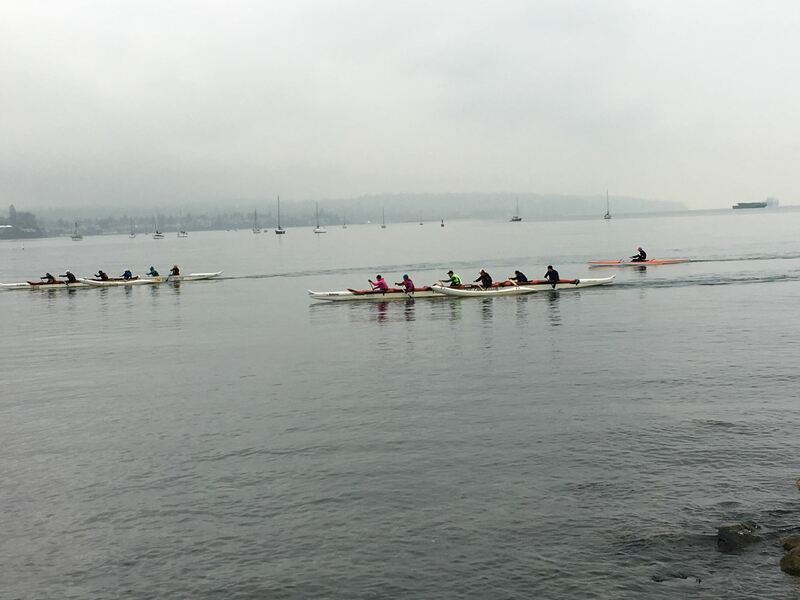 Our annual New Years Day row, was beautifully planned; crew up on the beach, row out to the bell and take selfies, maybe luck out and row with some harbour porpoise, and then gather for camaraderie and pot-luck to exchange smugness on starting the year off right. The last day of 2016 was still, flat water, not a breath of a wind. It was our water, rowers water, but a day early. And clouds heavy with snow for New Years Eve. Rowers water and fresh snow will make for a beautiful start to the year, right? The ocean canoes are built for waves, but got “rowers water” instead on the last paddling day of 2016. They got “our” water, and we got theirs! The first day of 2017 was sunny and bright, but cold. 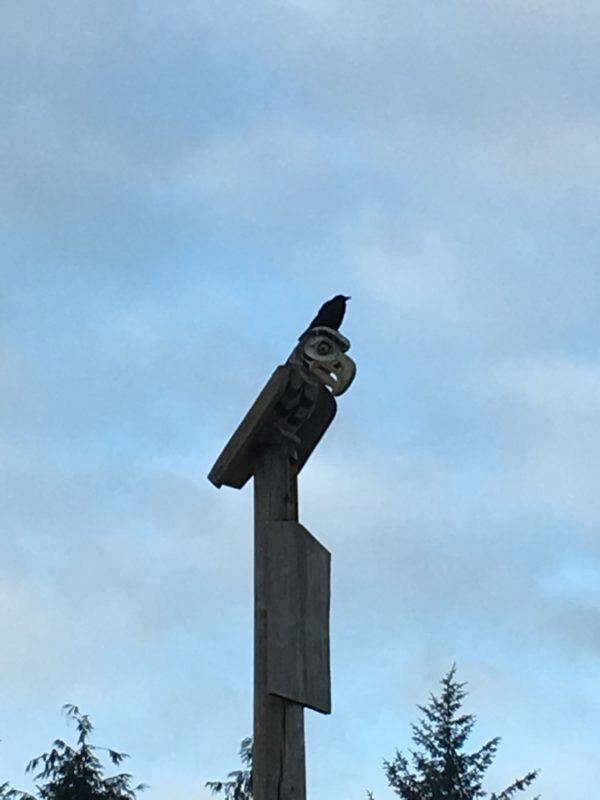 A good sign. No need to check the forecast, it’s always nice water in the winter, right? We navigated the fresh snow and ice en route to JERICHO. When we pulled into the parking lot, we saw the clubhouse windsock. Horizontal. ” Maybe it’s not windy, maybe the sock is frozen into that position” I thought, hopefully. 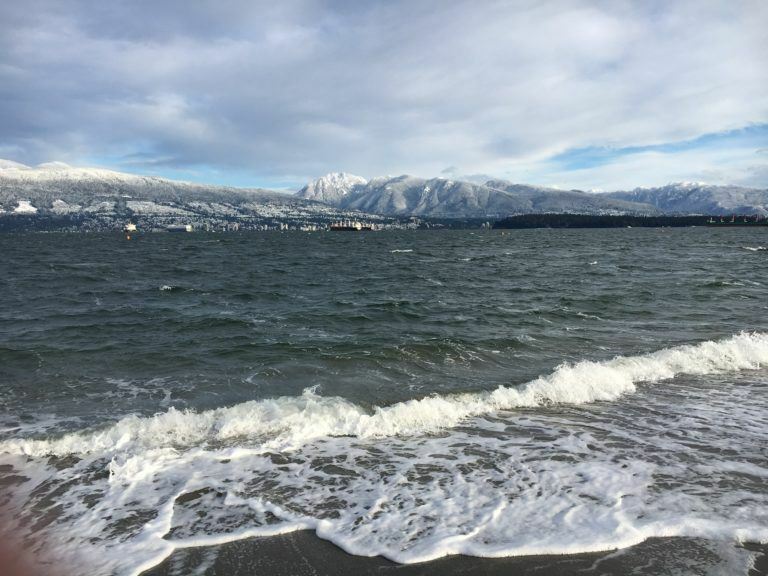 Hoping for freezing temperatures rather than wind and waves is the sign of an optimistic rower, unwilling to allow plans to go awry. Not a good sign. But we were undaunted. The skate from the car had us all concentrating on staying upright, and not polishing the ice with any bruised body parts. 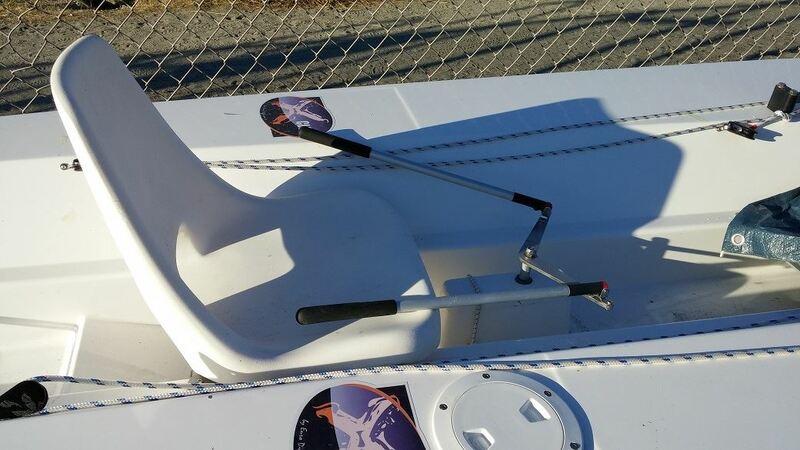 I was wondering how to get any ice off the boats, and if the boat Dolly’s were under snow, and if the oar locks would be sticky. This will be interesting, I thought. Then we saw the water. The roiling, boiling, smashing water breaking on the beach. And the sheet of ice that was the launch ramp. So now the challenge was in actually getting the boats down to the beach, without breaking anything that we cared about. (Boat and bum equally valued). And then of course there would be the challenge of launching into 3ft waves. Oh, and then the rowing against a steady 17 kt breeze, gusting to 20kts and freezing the windsock. A steady 17 kts breeze and 3ft chop, kept the Salish Sea rowers warm, dry and ashore today. 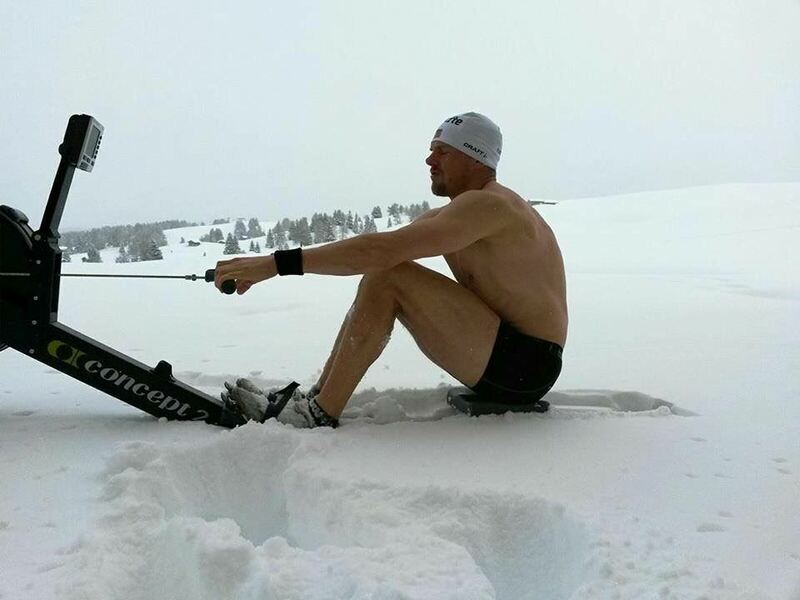 Rowers are generally optimistic creatures, we see “challenges”, not impossibilities, and “fun”, not hazards. 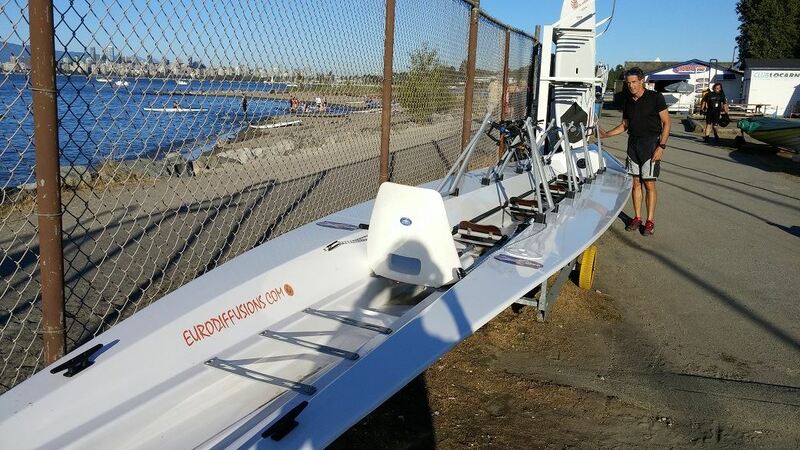 We have a coastal rowing club so that we have bigger boats for bigger waves. But today, we didn’t launch. We drained our thermos’, remained hopeful for better water in the days ahead, and when a crewmate suggested brunch, we navigated to a warm kitchen. Where we of course, talked about rowing. Happy New Year everyone. Salish Sea entered a double and single into the race around Cormorant Island in the Alert Bay 360 race. Oh, and 90 other kayaks, surf skis, canoes, OC1 and even a pontoon-catamaran- peddley -craft-thingy raced as well. Marla & Ruth, Annette heading to the start line. On the days leading up to race day, paddlers and rowers alike paced the shore, cursing the 35 kts winds (gusting to 45) and 6 kt currents that were threatening the race. Never have so many paddlers demanded, pleaded and prayed to the weather gods ” stop the wind, stop the wind, just for a little while. I promise to be good”. After three days of high winds, we were desperate. Race day dawned with manageable 15kt winds, a strong current and a flood tide. Over 90 boats launched into the headwind and the race was on. 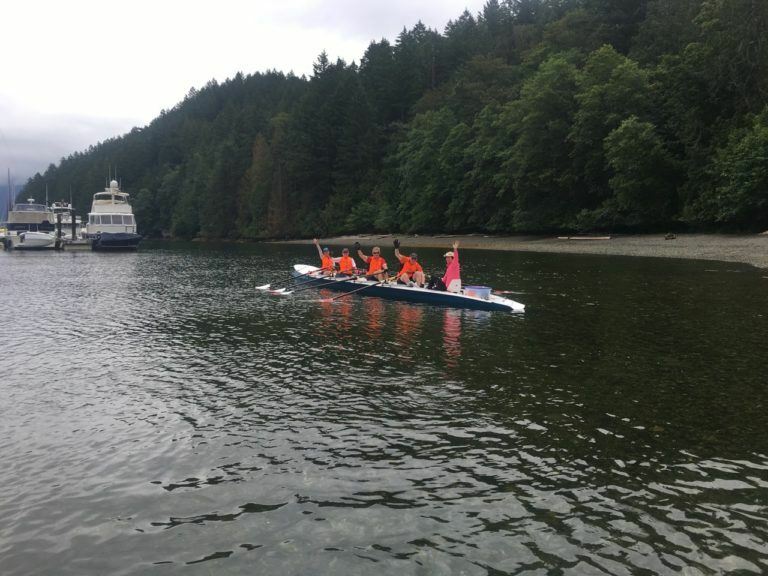 The head current was strong, giving an advantage to our Salish Sea rowers as they powered past anything driven by arm strength. Legs always win. Then it was 2km of broadside winds and 2 ft chop, pushing small boats into the kelp beds and rocks. No advantage there. Then for one long 5 km stretch it was surf ski heaven. Picking through the currents and eddies to find the fastest run, these greyhounds of the waves owned the beach. And the it was the rowers turn. We started to pass groups of boats,finding our zen speed on the north stretch of the race. One thing rowers know how to do is race a long straight stretch of water, we live for it. Rounding the final point for home, the hard work started. Legs against a 6kt current means you can’t let off even for a second. (Feels like an erg on setting 10). And the headwind joins in to bring out your stubborn. The shores were lined with folks cheering us on, banging drums and bells. 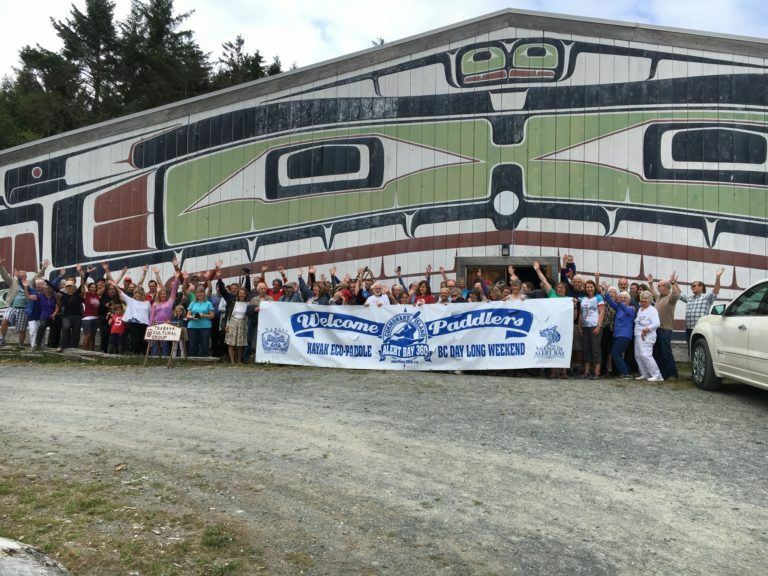 Wonderful to have the community of Alert Bay urging us on. Hulagirl welcomes Annette back to beach. It’s a loooonnngg row in dog years. After the race, the showers and prizes it was time for a celebration at the Big House. 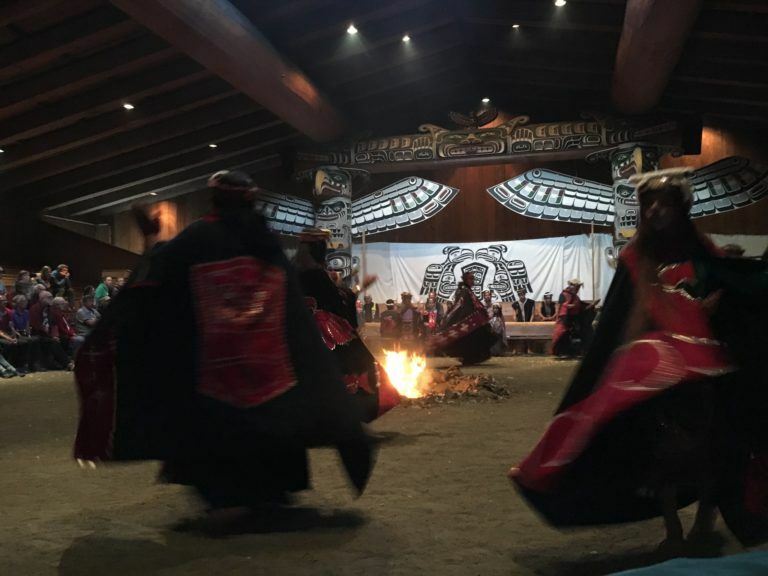 An evening of song, dance and food hosted by the T’sasa’la Cultural Group brought home to us all how important it is that we stay connected with our ocean through our sport and through our behaviour. Alert Bay with its clear clear waters, abundant marine life and skies filled with Eagles is a potent reminder of how precious our planet is. Gilakas’la Alert, thank you for hosting us and for reconnecting us. We are Salish Sea. Crew1 "Hey, does anyone wanna go to Bowen, I heard there’s a race that will accept rowers?" Crew2 "Sure, let’s do it. How far is it?" Crew1 "Well it can’t be that far, it’s only a little island after all." Crew2,3,4 "I’m in, me too, me three." Crew 2,3,4 "Angie will. Just don’t tell her it’s for a race." Angie "Hi guys what are you all talking about?" Crew all "Hi Angie, wanna go to Bowen for a beer?" Thats how it all starts, a group of people who say yes, and then figure out the details. 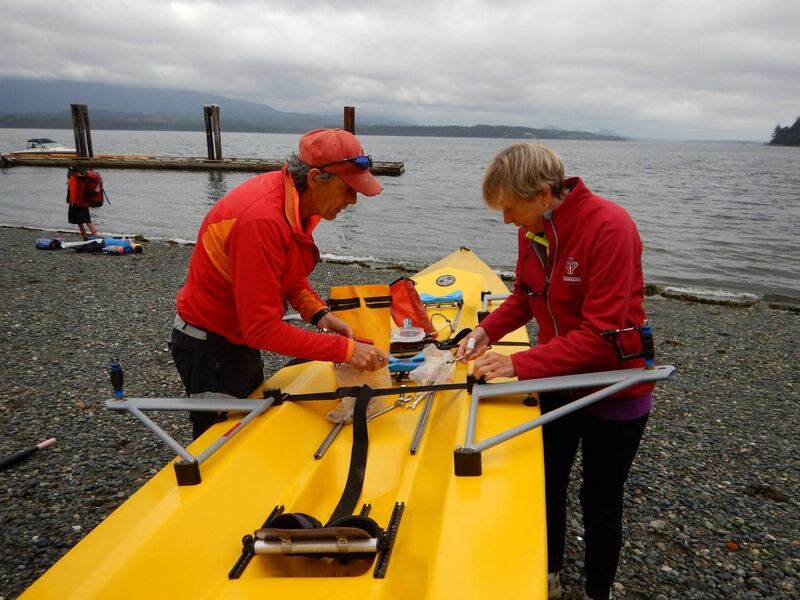 The Salish Sea launched a coxed quad and a men’s double into the Race Around Bowen - a 32 km race featuring surf ski, kayak, sup and 2 rowing boats. The weather was perfect, the water ranged from 4 ft ferry wake, to 3 ft chop, back eddies and even some dead flat zones. 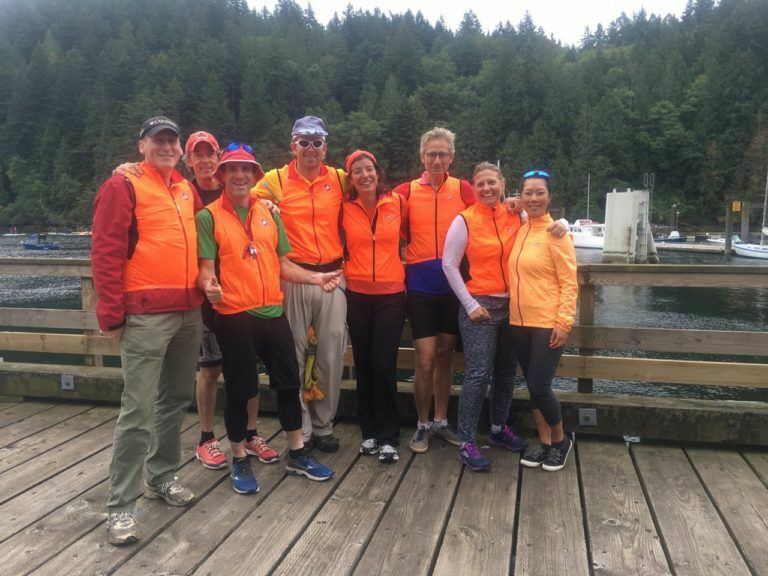 The fine folk of Bowen welcomed us at the finish with a salmon BBQ, prizes and the coldest, bestest beer in the world! We will be back next year. Just don’t tell Angie. 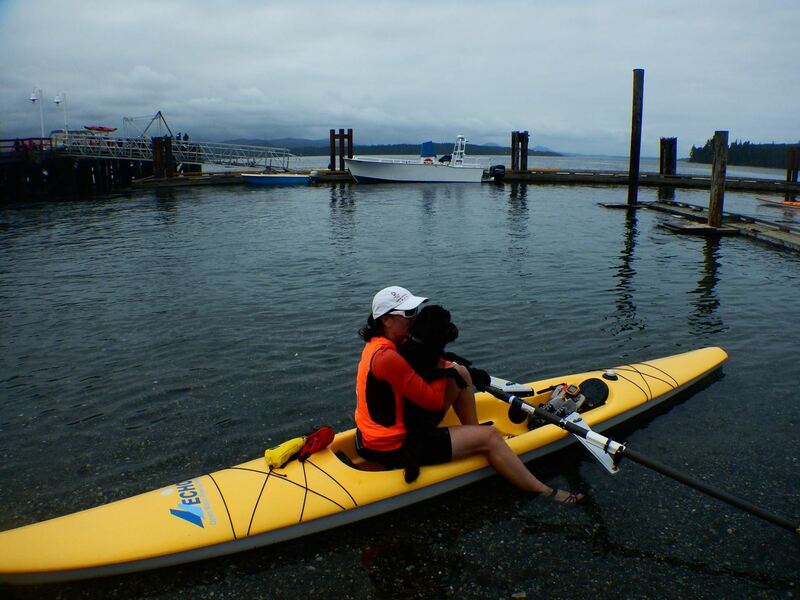 JSCA’s WaveChaser Paddle Series off to a Lighting Start! JSCA WaveChaser Paddle Series got off to a lightning start last Thursday – literally! Our own Michael Stephen was mid race when…. Register on our events page for the next WaveChaser Event on June 9th! 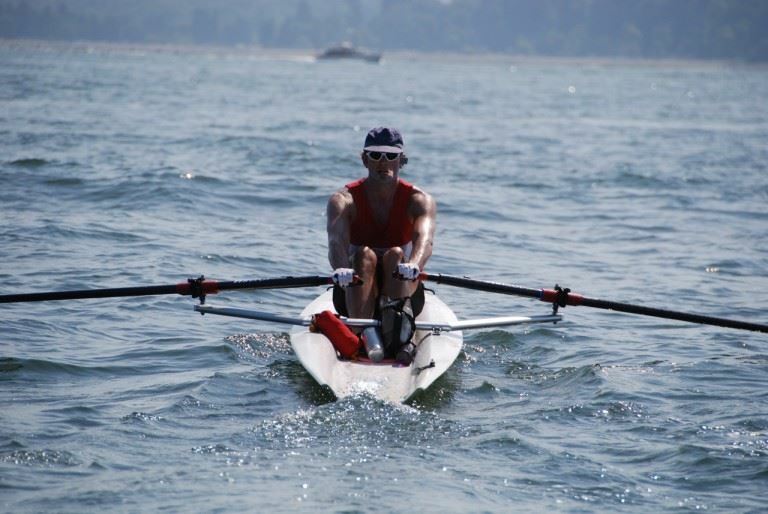 This Photo was taken in 2014 but last week Michael was lonely as the only rower in the JSCA WaveChaser Paddle Event past week! Join him at the next WaveChaser event! JSCA Open House a Rowing Success! On May 14th, 2016, Jericho Sailing Centre hosted it’s Annual Open House. The weather was perfect, member clubs, their members, JSCA staff and volunteers were all there in fine form to highlight all she had to offer. And so were we! Thank you to everyone who came to help, promoted, lifted, oared, and sipped to support SSCRC! Thank you! JSCA Open House and SSCRC Guest trials!